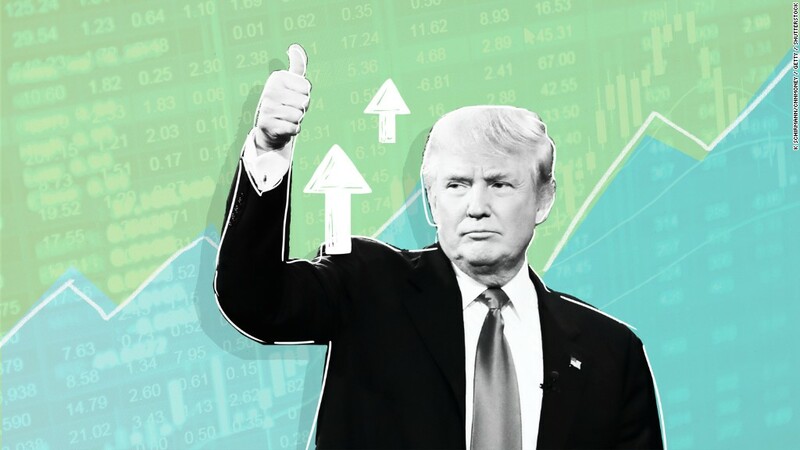 The Trump bump for the stock market may be a thing of the past. Investors are suddenly very nervous again -- and with good reason. Corporate executives are abandoning the president. There are also growing doubts that Trump will be able to get much, if any, of his lofty economic plans through Congress now that even some Republican lawmakers are issuing harsh criticisms of him. Tragic events in Barcelona, Finland and Charlottesville have reminded investors around the globe that the world remains a scary place. The Dow plunged nearly 275 points Thursday and fell more than 75 points on Friday. The market did bounce off its lows after it was reported that controversial White House chief strategist Steve Bannon was fired. It's not as if stocks surged back, however. But to be fair, it's worth noting that the Dow is still up 10% for the year. This group of blue chip stocks is not far below all-time highs that it set on August 8. The Dow, S&P 500 and Nasdaq all fell just slightly for the week as well. Dig deeper though and it's clear there is a pretty notable shift in market sentiment. Gold prices, which often rise when investors are worried about geopolitical turmoil, rose above $1,300 an ounce for the first time since last November. The yield on the U.S. 10-year Treasury bond fell to its lowest level since June on Friday. It now stands at just 2.19%, down from 2.45% at the start of the year. That's significant because yields should go up if the market believed stimulus was coming that will boost the economy. What's more, the Federal Reserve has been raising short-term rates. That usually leads to higher Treasury yields, too. Then there's CNNMoney's own Fear & Greed Index, a measure of investor sentiment that looks at volatility and six other key market barometers. Our index is now firmly showing levels of "extreme fear." A month ago, the index was flashing "greed" signs. So could stocks finally suffer a so-called correction -- a 10% pullback from recent highs? We haven't had one since late 2015. Some market strategists don't think that a big drop is on the horizon, no matter what happens in Washington. Tom Anderson, chief investment officer at Boston Private, said that stocks still look solid because earnings have been strong. He conceded that valuations are high but stopped short of calling the market overvalued. Anderson also thinks that the risks of Trump doing something to roil Wall Street are overdone. "Our clients are concerned about Washington and Trump. But we don't think it made a difference who won in November," Anderson said. "There are investors who have taken money out of the market because they're concerned about politics. But it's hard to wait for some magical entry point. If you're expecting a 10% correction, you may not see it for a while," he said. But other investors think a pullback is not just needed, but likely. "Historically, corrections happen and given where we are with high valuations and mediocre growth, we are overdue. Investors need to be prepared for that in the next several years," said James Norman, president of QS Investors. He added that a correction may happen due to the political landscape in the U.S. and jokingly referred to a possible "blonde swan" -- a reference to President Trump's hair color and play on the term "black swan" used to describe market rattling events.